Tibouchina is commonly known as Glory Bush or Princess Flower. 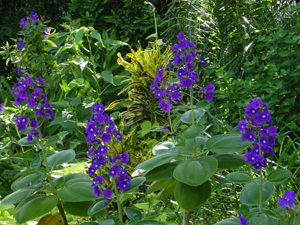 It has eliptical leaves and bright showy purple bloom clusters. It blooms best in full sun. Propagation can be made from soft wood cuttings. It is not salt tolerant. In colder climates it should be brought in over winter, or treated as an annual. T. granulosa can grow to 40 feet in its native Brazil and Bolivia, while T. hetermolla remains a small 3 feet. I received a cutting from a new friend back in 2001. It grew to be the plant you see pictured here, but I couldn't keep it alive. I purchased other varieties, but had the same failed results, apparently because I'm not close enough to the equator. This plant will do much better in the Miami area or further south, unless you're willing to bring it inside during colder weather.